Froggys Fog has "A Fluid for Every Effect!" Our Haze Juice line is no exception! We have a water based haze or oil based haze that is compatible with nearly every machine on the market. If you are not sure what you need, check out our machine compatibility chart or our comparable fluids chart. 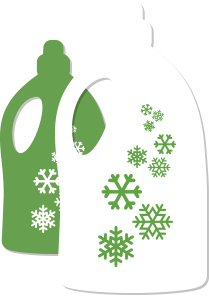 Froggys Fog uses the best chemicals and water so you get the best results from your machine. You can rest assured that each of our fluids has been designed with the longevity of your fog and haze machine in mind. Froggys Fog Faze Haze is designed for Antari F-1, F-5, F-7, Chauvet Professional AMHAZE 2 and Martin Compact Hazers. A very fine veil of airborne canvas is produced exposing light beams with a moderate refraction rate. Faze Haze is a premium water based haze fluid. 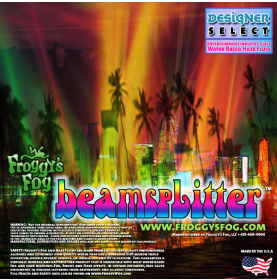 Froggys Fog Beam Splitter Pro Haze is designed for a wide variety of water based Hazers. A very fine veil of airborne canvas is produced exposing light beams with a moderate refraction rate. Beamsplitter is a premium water based haze fluid. 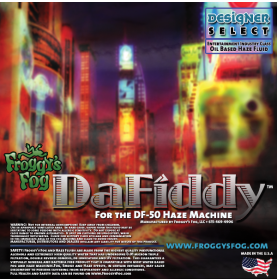 DaFiddy Oil Based and Oil-less Haze Juice - Formulated for the DF-50 to be the perfect airborne canvass, DaFiddy is the Pro Lighting Designers perfect affordable solution. 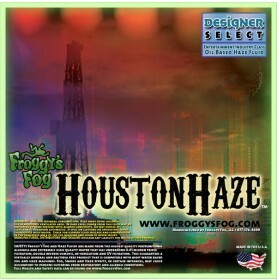 Designers Select Houston Haze - Oil Based Haze Juice - Compression Based Machine Fluid. Houston, No Problem Here!... Just the Highest Quality, Vitamin E Fortified, Oil-based Haze Juice which creates a perfectly uniform particulate for flawless beam refraction. 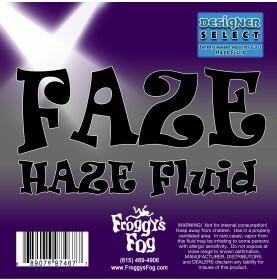 Froggys Krazy Faze Haze is designed for For Martin K-1 Hazers. A very fine veil of airborne canvas is produced exposing light beams with a moderate refraction rate. Krazy Haze is a premium water based haze fluid.